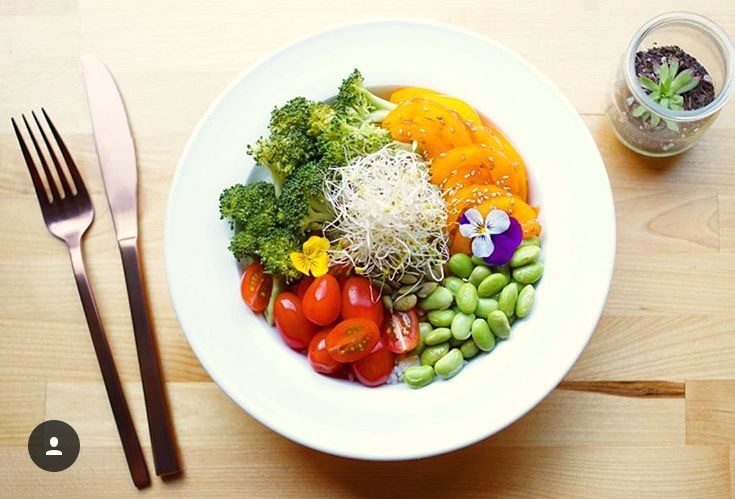 At GreenHut we believe that high quality food is one of the keys to living an optimal life, so we aim to provide delicious nutrient packed food and drinks that not only taste great, but help to support a balanced diet. Above all else, we firmly believe that you cannot make quality food by using lacklustre ingredients. Which is why we have worked extra hard to establish relationships with some fantastic local purveyors who are just as passionate about food as we are. We never cut corners. If we can feasibly make something ourselves, we will. From scratch. Using whole ingredients in their most basic and fundamental form. You know, the way food was supposed to be made. Throughout the weeks we rotate through a variety of killer main dishes while leaving room for creative spontaneity. Our stews, curries, wraps and sandwiches are just a few of the highlights. You can expect lots of vegetables, legumes, fruits, greens, nuts, seeds, and healthy fats in our dishes so you are left feeling satisfied. Each week we work with our friends at Suoto Farms to bring you dishes created using what is fresh and in season so things are always tasting as good as they possibly can. Never to leave anyone feeling left out, we always try to offer our meals with the option of being gluten free, vegetarian, dairy free or vegan. A crowd favourite since day one. A seasonal fruit smoothie base, layered with granola and stacked high with heaps of fresh fruit and seasonal berries. We make these babies fresh to order everyday to give you a taste of summer all season long. At GreenHut we never treat our salads as an afterthought. That's why we use the highest quality greens that we can get our hands on, load them up with tasty and nutritious fruits and vegetables and top it off with some nuts and seeds packed with loads of healthy fats. We also make all of our dressings in house from scratch for that perfect pairing. Feeling especially ravenous? Go ahead and add some avocado or quinoa for an extra boost if that's your thing. Because, with so many delicious possibilities out there waiting to be discovered, we are only limited by our imaginations! Our beautiful food trailer, Penelope, isn't blessed to have an oven so we have to get creative using raw preparations for our desserts. We happen to welcome this challenge and we think we have come up with some delicious results! Each of these tasty treats is prepared lovingly by hand to give you a serving of joy in each bite. Proof that the world is full of potential if you simply open your mind. GreenHut's story began with smoothies, so it's no wonder we love them so much. We are always working to come up with new and exciting flavours while keeping the focus strongly on nutrition. Organic fruits and vegetables are the star of the show here but we also like to throw in spices, herbs and superfoods to keep things tasting unique and amazing. Perfect for sipping on a summer day or stuffing in your daypack before heading out on your adventures! Been slacking off a bit to much lately? Feeling a bit under the weather? Or maybe you're just looking for a quick pick me up. Look no further! Nothing rivals this little guy's nutritional punch. Each juice is packed with loads of health supporting vitamins, minerals, and antioxidants to keep you going strong! 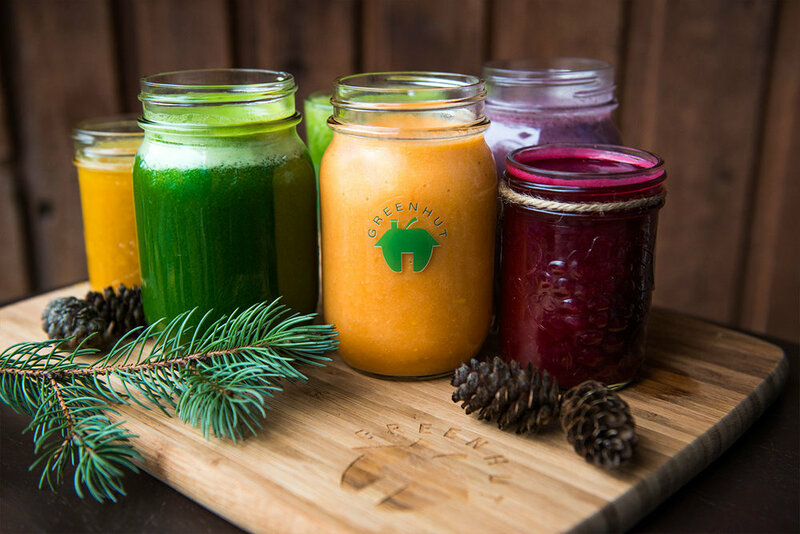 We craft our juices each day in small batches so that we can serve them to you at their peak freshness and tastiness. Check often, as we change up our flavours depending on what is fresh and in season.